One of Australia’s most loved summer festival FOMO returns this January, announcing a mega line-up of artists leading in both hip-hop and electronic music, all with one stage and zero timetable clashes. The one and only Nicki Minaj will be headlining for her first Aussie festival tour, following the release of her latest album, Queen. Widely regarded as one of the most technically skilled rappers working today, Minaj is the rare star whose commercial success hasn’t stunted her critical appreciation. 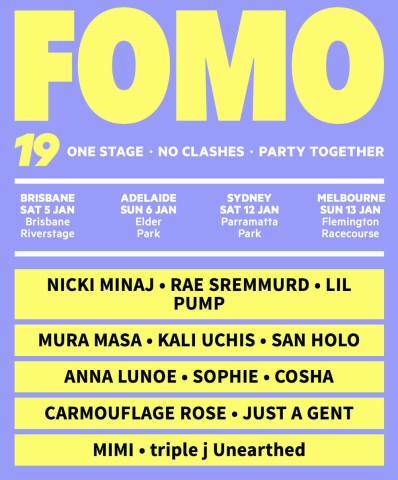 After selling out all dates in 2018, FOMO, the one-stage event returns in 2019 for their biggest tour to date, and for the first time offers a full-day instalment on Saturday January 5, the FOMO touR kick's off where it all began at Brisbane’s Riverstage, before heading down south to Adelaide’s Elder Park on Sunday January 6. The festival will then venture across to Parramatta Park’s natural amphitheatre on Saturday January 12, ahead of a spectacular inaugural closing date in Melbourne, seeing ticket-holders grace the outdoor Flemington Racecourse on Sunday, January 13. Local talent will also be on show with Melbourne DJ Mimi and Zimbabwean-Aussie rapper Carmouflage Rose. The festival will again partner with arts organisation Heaps Decent to donate $1 from each ticket sale to the Asylum Seeker Resource Centre.